Hilo sometimes gets bad press for being on the ‘wet’ side of the island. While this is true, and Hilo doesn’t see the amount of sunshine and clear skies that are standard for the west (Kona) side, it doesn’t mean you should stay away. Just count on getting (tropically) wet once or twice, and enjoy the lush rainforest that grows because of the rain. 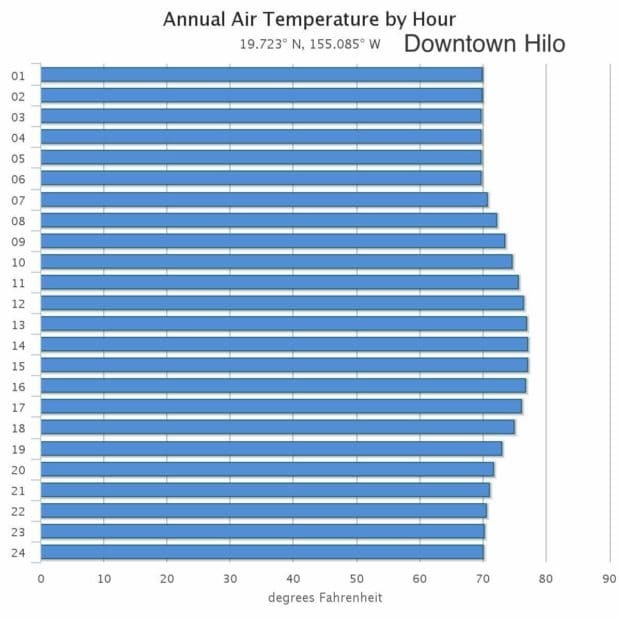 You can see this in more detail below, where we present you the yearly averages for Hilo for the temperature, the precipitation and the number of cloudy days. Average temperatures in Hilo are between 70°F and 75°F (21 and 24 °c). 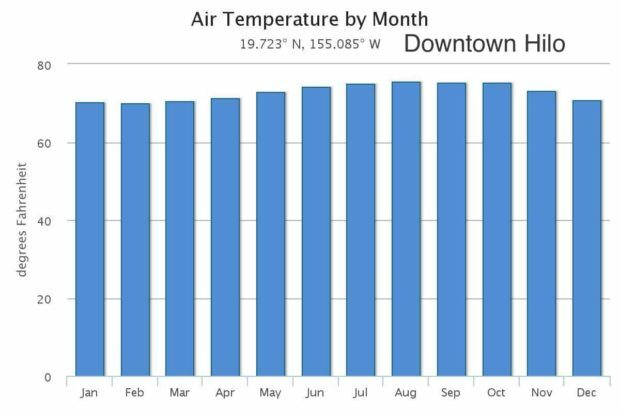 August is the warmest month, and January the coolest. However, and especially for those visitors from the US mainland, temperatures here are always pleasant. As mentioned above, Hilo lies on the windward (rainy) side of the Big Island and receives quite some precipitation. 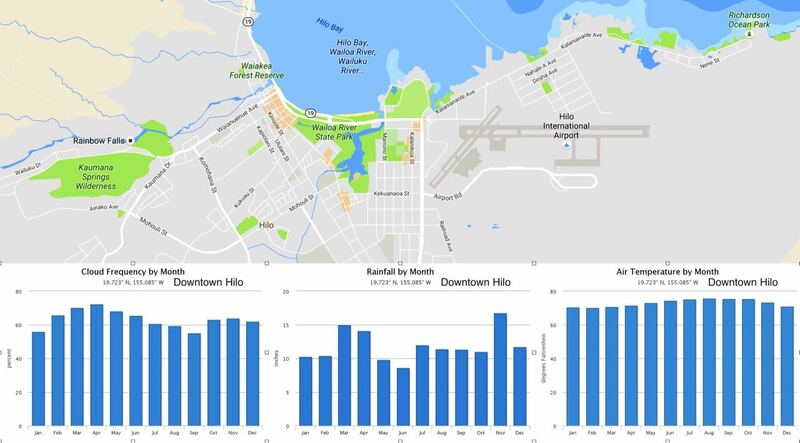 For example, downtown Hilo gets 142 inches of rain per year. Compare this to the 9 inch at the resorts close to Waikoloa, and 27 inches in downtown Kona. 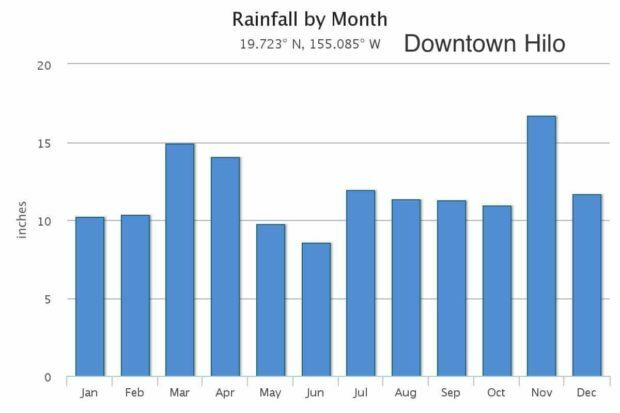 The wettest month is November, the driest month June. Most of this rain falls between the late afternoon and early morning, but especially in March/April and November/December it can be wise to pack a small umbrella. Roughly half of the days in Hilo are completely cloudy. March, April, and May are the most cloudy months, with clouds blocking the sun on average 70% of the time. September and January are the sunniest months, with a cloud cover between 50% and 60% of the time. There are only small differences in cloud cover throughout the day. More often than not, you will see a cloudy or rainy sky in Hilo. However, about 40% of the time the sun will break through. 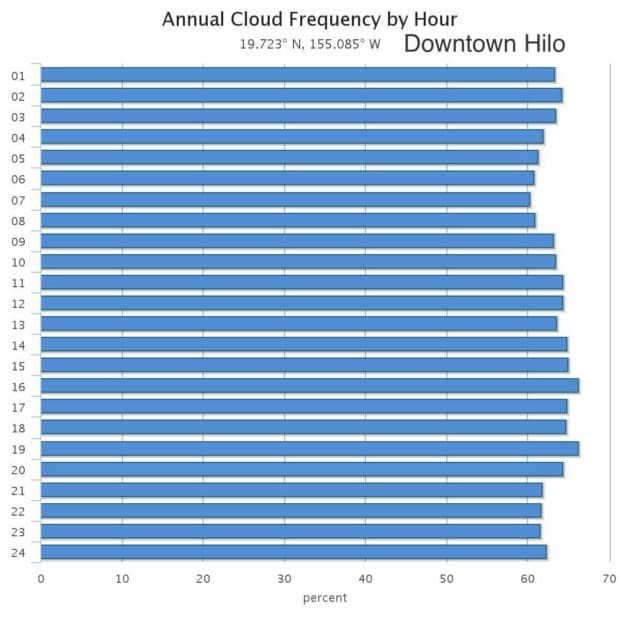 The hourly average amount of cloud cover (left image) and temperature (right image) for downtown Hilo on the Big Island of Hawaii. See the “Sources” section below for image credits. Throughout the day there is only a limited (5 °F) variation in the air temperature. Direct exposure to the sun will make it feel warmer, and windchill and rain cooler. If you are interested in the current weather conditions and weather forecast for Kona, please look up the NAOO forecast. we summarize all the information above in the following table. 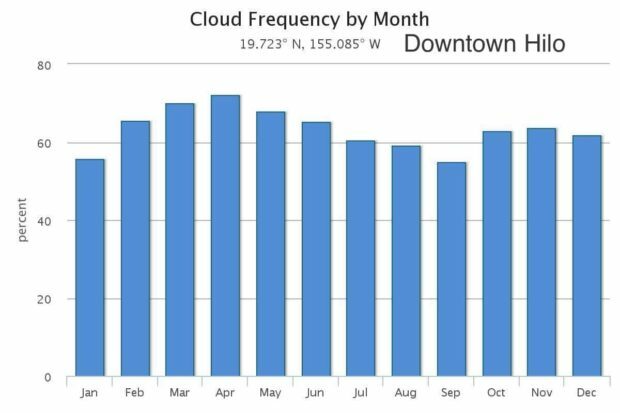 In the table you find the monthly averages for the air temperature, the amount of rainfall and the percentage of cloud cover. If you are looking for 100% sunshine during your Hawaii Hilo is not the city for you. 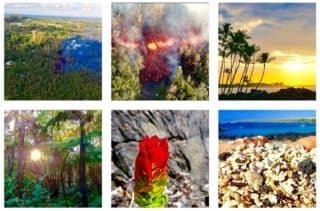 Anyone else should reserve a couple of days in their itinerary for the ‘wet’ side of the Big Island to get a taste for the lush, damp, warm, and green side of the Big Island.